I’m looking for ideas to get more people engaged in the proyect and even put together a promotional video that could be posted, embeded and shared. Well, that’s one idea; the video. So, any suggestions for that? If it were the case, would you be willing to send a picture of you playing eyewire that could be included in the video? Also, I think it would be great to create a sense of community, that we’re all doing this together. In that sense, these are a few ideas for your consideration. 1) A world map to see where people involved are located; it would be great if it were “live” somehow and we could see who’s working at a given time. 2) A photo gallery of people playing eyewire, even with their families if it were the case; my 7-year-old daughter likes taking part too. 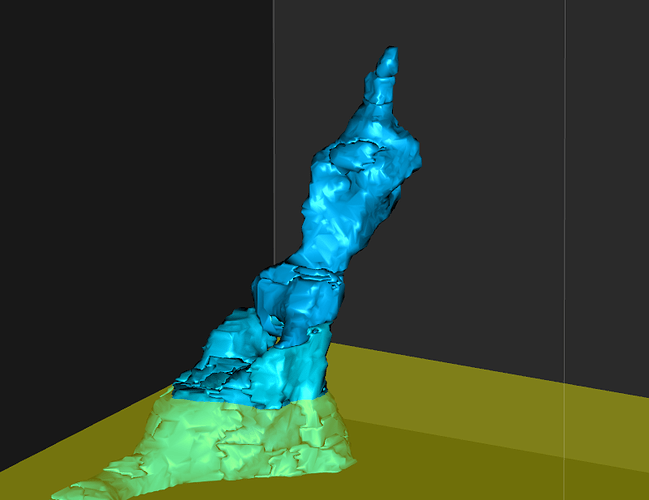 3) Maybe a photo gallery of curious and fun findings in the images: this looks like a gnome (I’ve seen several in 2D), this 3D image looks like an ice-skater; of course, having a 7-year-old around helps. I’m also suggesting to the eyewire team to display a short brain-fact every time a task is completed; that way we collaborate as a community and spread brain culture as a benefit to all. Also, for high-schools (or any other group; friends, families) people could register not as individuals but as teams; or there could be an option in the registration were you could add yourself to a team so you take part as an individual but also add points for your particular team. Well, that’s a lot. Please, make any comments you like and anything you can think of. Thanks for the suggestions! We’re always looking for better ways to help people get engaged and share in the fun. We’ve actually thought of a few of those ideas you mentioned as well. We’d be happy to hear any other thoughts people have going forward. I can tell you right now what the main things we are working on to help with community engagement. We’d like this forum to blossom and grow, and find better ways to help new users learn. We’re in the process of setting up an FAQ which will be integrated with the forum, and it would be great if we could find some community members to help ask and answer questions for that. We’re working on setting up a wiki centered around this project. The goal would be to provide context for users who are interested in learning more about the science that we are working on. We would also use it to help document our findings as we segment more neurons and figure out how they are connected. We’re trying to set up as many avenues for everyone to help as possible. Posts like these help us toward that goal, and if anyone wants to volunteer to help us manage these resources, it would be much appreciated. Keep the ideas coming! This is my first post, altough I played quite a lot with Eyewire, since it has started (the scores were low when I began!). First of all, congrats to the developers and scientists behind, I find Eyewire one of the most addictive citizen science projects! And it keeps getting better! I have an idea on how to get more people engaged. Well, actually on how to get people more engaged. The idea is to make a personal gallery for each user to save their favourite neurons (or better, in which every neuron gets saved, so one can later choose their favourite ones). Then, make it easy for users to link and post them in the forum, to showcase the most beautiful and interesting ones. Some threads could be dedicated to particular/recurrent shapes, and discussions would stem from that. To make it work, I think the gallery should display the 3D box for each neuron, and also in the forum, small 3D boxes are needed to showcase them. There is no other way to see them! Do you think is possible to implement something like that? (all those 3D boxes would be resource intensive…). Other users, what do you think? Please comment! @eluchinat I’m just behind you on the leaderboard I like the neuron gallery idea. You could save and share not only your favorite neurons, but captions like “the ice skater” and “the iceberg” given by @joseerre. Both of those are really funny. @joseerre I’d love to see a photo of you and your daughter eyewiring together. That sounds cute. We were wondering whether the site would be fun and doable for young children like her. Some parents tell me that their kids learn faster than adults. I like the world map idea. That’s fun as I think this group is really international. We have been thinking about doing something similar, which is to display a national flag besides each name on the leaderboard. Teams are definitely on the to-do list. And so are brain facts. So much to do! Teams are a big plus - take a look at FoldIT (fold.it). I don’t participate in teams any more, but most people seem to like them. They also do a wiki that is maintained by the players and is fairly comprehensive (and there are multilingual variants). Something you could look into is to organise human Vs computer competitions. For protein folding, this is handled by CASP, but the only competition I know of in this field is the DIADEM challenge. An idea would be to give people a stating point on uncoloured images and compare what they get against computer tracing algorithms. @eluchinat It should be possible to set up discussions which include the 3d view of a task/nuron. I think to avoid melting people’s computers, we’ve have to restrict it to 1 per thread. But as Sebastian has mentioned, we’ve got a lot on our plates at the moment. We might not be able to set this up right away. @joseerre had fun with static 3D views. That’s all we need for the gallery, and won’t be computationally intensive. I give you: the finger! Bad for crowdsource science, but I’ll bet Simon Cowell could make a program out of it. Actually, on the more serious side, you could consider adding IRC chat at some point. This comes with the plus of realtime comms which are vital for team play, but as was discovered in FoldIT, you need moderators or else if certain schools start playing, they can become very offensive. Oh - there’s another point - get schools involved. The game is simple enough to do, but can reveal something rather complex about biological systems. I’ll guess that most people have never seen or imagined how complex real world systems like the retina really are. Perhaps we should use Stack Exchange as a building block for this instead? Probably EyeWire isn’t big enough to make it through the Area51 proposal process yet, but it’s something worth keeping in mind if it were to grow more.The Q&A format of Stack Exchange works very well. Also, I believe some of the more science like questions which are asked here are perfectly acceptable on the already established Cognitive Sciences SE site (when it relates to cognition) or on Biology SE (when it doesn’t relate to cognition but solely the physiological aspect). Of course you can link them to EyeWire in your questions. Additionally, why does it take so long prior to being let into the system? How long is the queue of people currently wanting to participate but that haven’t received their invitation yet? I may have a potential team(s) for eyewire. I’m taking a nervous system course at the College of Westchester in NY in May. I told my current professor about the citizens science project a month or so ago and she recently asked me about signing her nervous system classes up to eyewire next semester. I offered to ferret out the info. The recent updates would make it pretty easy for professors to track their students. It would be pretty remarkable if we could get schools across the globe collectively mapping connectomes as school and/or regional teams. Write the Wikipedia article for Eyewire. Right now there’s only a brief mention. See the Foldit article for an example of what the article for Eyewire should look like. People looking for human computation games to play will then be able to find information about Eyewire. @whatthecode That is a great idea. I like stack exchange too. That’s actually a large part of the reason that I chose this forum system. It includes a lot of the same things that they do including, if we want to use it, a karmaesque system with badges and stuff. The reason that I prefer this to a stack overflow site is that this allows us to have discussions too, not just Q&A. In general, I’d say that threads like this would more appropriately be discussions rather than questions. It’s a great thread, just not one with a clear cut answer. As the community develops, we’ll develop some policies and things, and set people up as moderators. I think we can manage to have an SO-like site and a more traditional forum side-by-side. As to letting people in, we’re getting ready to open the floodgates soon, so stay tuned! @robertb If anyone wants to volunteer to start writing the Eyewire wiki page, it would be a huge help for getting the project off the ground! I’ve started the EyeWire Wikipedia page. Please help improve it with corrected information, technical data, history, references, and so on. I've started the EyeWire Wikipedia page. Please help improve it with corrected information, technical data, history, references, and so on. I’m no Star Trek fan but, is it me or this looks like the USS Enterprise? EyeWire team: I’ve gone as far as I can with the EyeWire article on Wikipedia by scouring whatever information I could find on the EyeWire pages, the WiredDifferently pages, and the forum. We need a section on the history of the project (if indeed there were any precursors that Sebastian worked on, and perhaps how he came up with the idea of using human computation for EyeWire), and the article needs to be checked for accuracy. Thanks @robertb! It’s really appreciated, and its a great start. @backupelk and @laure bersig Great idea about getting schools involved. We’d love to do that. @echo is working on implementing the team feature. @laure bersig Could you and your professor think about how to use EyeWire to teach students about the nervous system? I.e. some kind of lesson plan? That might help us as we implement the team feature. Like @backupelk, when I saw this kind of image data for the first time, I felt overwhelmed by the complexity of the nervous system, which I had never truly appreciated before.